I’ve been doing some work on trying to figure out some color themes for light and dark modes for a UI (aren't we all these days?). Basically, given a particular light theme how might we determine the “equivalent” dark theme? After a couple of experiments/prototypes I started to use contrast ratios between colors to calculate the dark version of the UI. 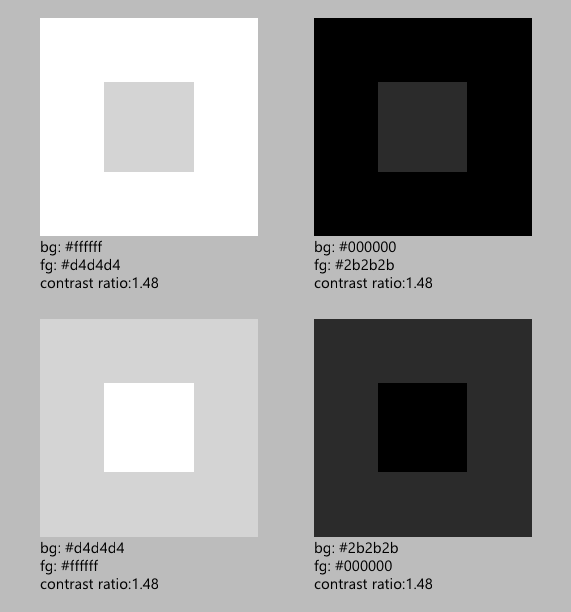 For one version, the hypothesis was that if the contrast ratios were the same between two colors across light and dark themes, they would be just as easy to distinguish in either mode. I think I’m learning that is not the case…because of how math works. I was hoping someone here might have some insight on this. I’ve been scratching my head on it for a while. In the image below I have two sets of colors (light set and a dark set). The contrast ratio for the two sets are both 1.48. I would think that if two sets of colors had the same contrast ratio they would also appear to have a similar difference between the background and foreground of each set. Note: Given a contrast ratio of 1.48, I know that these particular colors shouldn’t be for text but this is just an example to illustrate a problem. 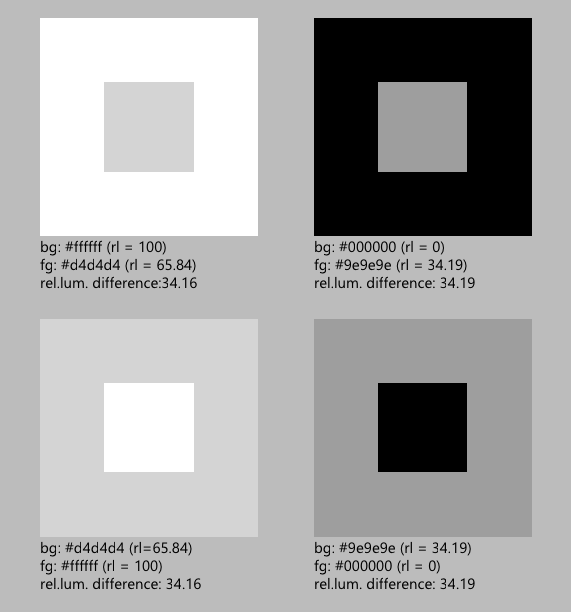 However, in the image above the light set of colors seem much easier to distinguish than the dark set. 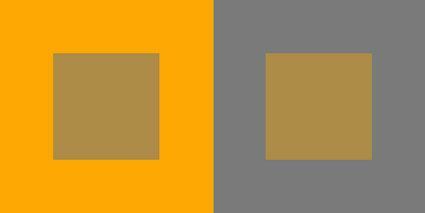 I know this is a bit subjective and can depend on a number of factors (my monitor, calibration, ambient lighting, how good my eyes are, etc..) but I was thinking that a similar contrast ratio would appear to have a more similar difference. It starts to make sense as I consider how math works, though. 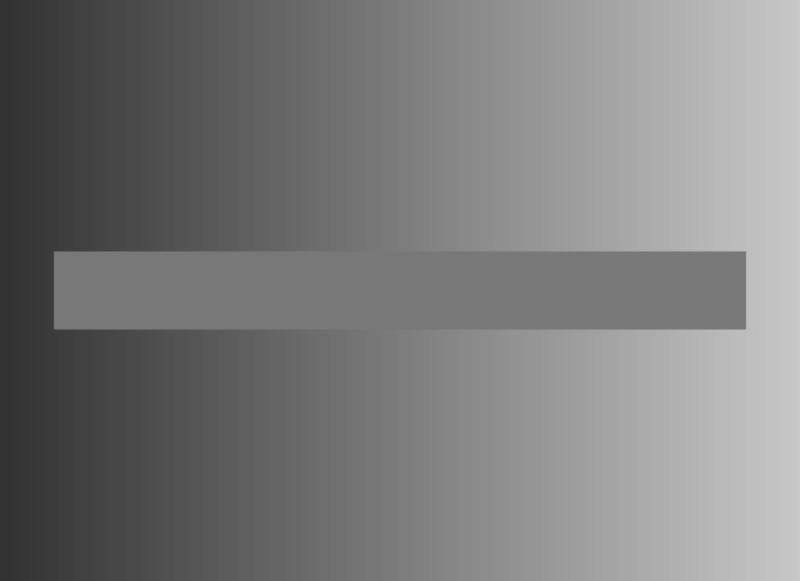 Darker colors at a given contrast ratio are going to be closer together in terms of relative luminance as opposed to lighter colors. In contrast (no pun intended), if I consider colors that have the same difference in relative luminance as opposed to ratio I end up with colors that look more similar (to me)...but still not right. All in all, I’m struggling to figure out if there is a way to calculate a dark theme based on a given light theme. Should I be basing it on something other than relative luminance and their difference/contrast ratio? Am I misusing contrast ratio in this case as it is typically (but not exclusively) targeted at text on background scenarios? Am I just crazy and the images above that use contrast ratios do, indeed, seem similar? Have I overthought all of this and there is a much simpler solution to create an “equivalent” dark theme from a given light theme? Equivalent, in this case, means that all elements of the UI are just as distinguishable and legible across both themes. Mathematics doesn't apply to everything, for graphic designers there are other types of procedures, many of them refer to perception. Try changing visual perception with mathematics... maybe. But, as written on the question there are several casual factors such as monitor setting. 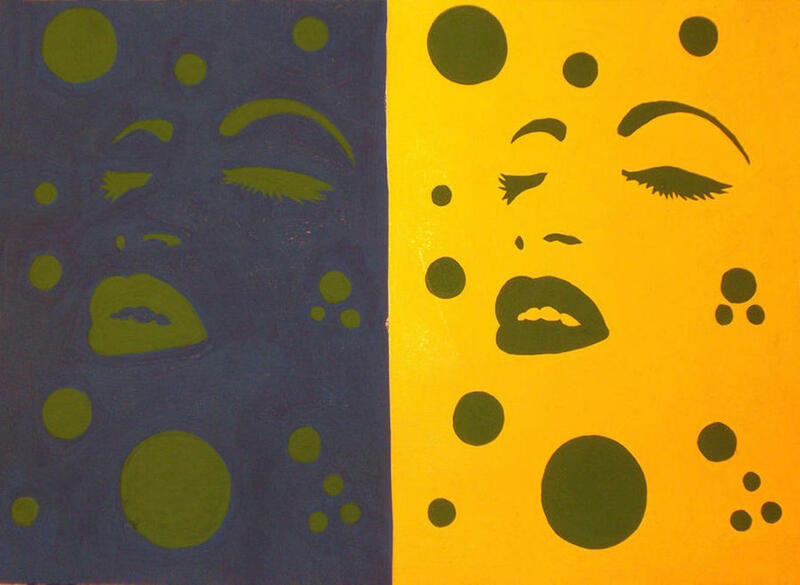 Simultaneous Color Contrast: the appearance of a color changes according to its context. 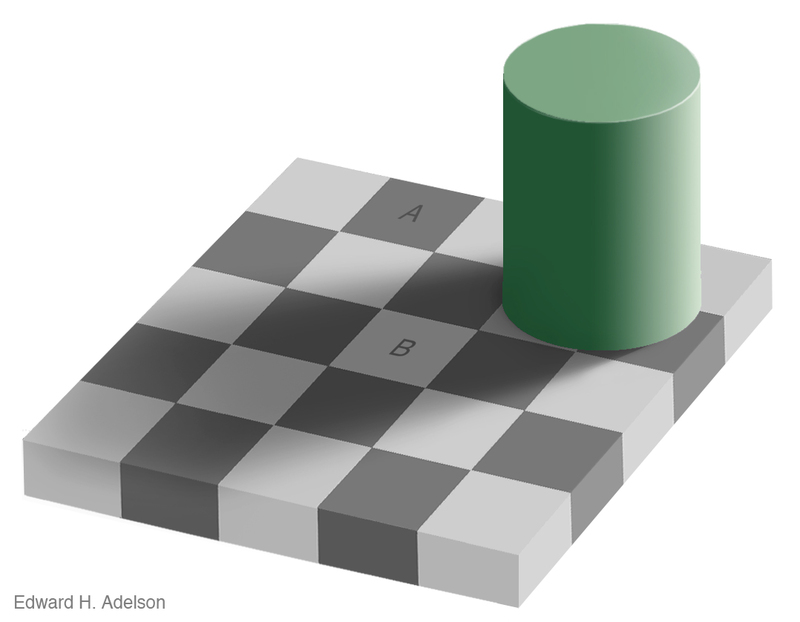 To make a color appear lighter: make it lighter or put a darker color surrounding. To make a color appear darker: make it darker or put a lighter color surrounding. At this image, the center bar has the same color (#7F7F7F). To make a color appear warmer: change the hue or put a cooler color surrounding. To make a color appear cooler: change the hue or put a warmer color surrounding. To make a color appear desaturated: just desaturate it or put a saturated color surrounding. To make a color appear more saturated: just saturate it or put a desaturated color surrounding. It is actually hideously complicated to calculate with color. It is very very easy to make a mistake. Color as we know it is a human condition, it arises in the head. Color as a technical issue is a bit convoluted to say the least. To understand color you need to understand that the system consist of at least 4 things that you must consider separately. Input into the system for processing, output of said system, the human eye and human brain. Now dealing with the values at level of raw input t the monitor does you very little good. First the monitor is not linear. So if we look at your first case you take the very naive assumption that color is linear. This is not true! You should never, ever, make this assumption. In both cases you have 43 units in between, the values. But the monitor space is not linear, it has a gamma correction on top of the image. Or not even a gamma correction most likely it has a modified gamma correction where few values close to 0 are in fact linear*, like in sRGB. So the fact that your seeing a difference is expected, in fact if you wouldn't see this difference it would be more than suspect. Even the real math behind the display systems tells us so. If you want to calculate things on color you need to take this into account (only you need to decide how correct is correct enough for you since the calculations go very deep). Now the way you deal with this is you switch to a device independent color space that does not have this kind of data non linearity. Which you have done. However this triggers the fact that we dont know how your monitor displays things. See the monitor has to be calibrated or profiled for us to even have a stab at knowing what it is sending to your eyes. The computer does not know, so if you want to do anything accurate then you must measure your monitor. Even if you have same brand of display it will display differently due to different age. OK then the eye, bad news, if you want to see accurate colors on your display then you need to look at your display in a area where the monitor is the brightest source, but not dark. Also the background coloration and lighting has to be neutral or your color vision is off. ** But the eye triggers all kinds of other things too like the pixel density, which affects how much the humans inbuilt sharpening mechanism triggers. Your later example triggers very heavy mach bands for me. Then the brain. Ok, now it gets just plain weird. This is what @Danielillo is trying to tell you. All in all i would say the later is correct, it's just that your monitor and environment is not really well defined. Color math is not for pedantic's. ** If you reached this far you will realize that calculating this value accurately is a bit futile as it changes during this time. But this is still the procedure to take for best guess. Also you probably get why many wouldn't do this calculation. Not the answer you're looking for? Browse other questions tagged contrast or ask your own question. Is there any color rule or theory for this kind of situation? How do I find a light on dark font? Given a white background, and black or grey text, is there a formula to find a link color with good contrast? How do I make objects and text stand out over a busy photo background?